"Mom, I can't be the President, I'm a girl"
And then I drove in to a tree. Well, I didn't obviously, but holy hell where have we gone wrong for Anna aged 7 to think that. I was truly, deeply shocked. Whatever else I may have thought about Margaret Thatcher, she was Prime Minister throughout my entire childhood and because of that fact I never once thought that I couldn't do anything because I was a woman. Except perhaps change down from 5th gear to 2nd gear. I still can't do that so I moved to the land of automatics. 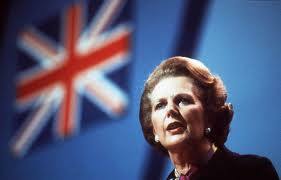 If you grew up in the North of England like me, there were plenty of reasons to dislike Maggie. Whenever we went to see my Nanna in Barnsley there were 'Coal not Dole' signs in every window. She also made it impossible for any woman over 40 to wear a blue skirt suit without being told she looked like her. Issues people, issues. I have nurtured a more deeply personal resentment. When I was Anna's age one of the best parts of school was being chosen to be the person to put the straws in the school milk. Every morning a crate of miniature milk bottles was delivered to our classroom and the lucky milk monitor, allegedly chosen at random, got to spear the lids with a straw. Anyone who knows the joy of plunging a spoon through the foil top of a Nutella jar or a jar of instant coffee *English joy only* knows what I'm talking about. I didn't get to do it very often. It always seemed to be someone else's turn. Some naughty kid who'd finally done something good, or some new kid who was being made to feel special. It got to the point that I finally plucked up the courage to ask my teacher if I could please, please, please be milk monitor soon. And she said yes. And then Margaret Thatcher abolished milk for kids in schools and I never got to relive that joy. I understand that she was trying to save money. Upon reflection I do see that there weren't a whole lot of kids running around with rickets in the leafy lanes of Harrogate BUT how was I ever going to make it to Prime Minister if I couldn't even become milk monitor? It still rankles. So now I'm going to lecture my daughters on why America owes them a female President, and then I'm going to have a Nutella sandwich with milk. I wonder if Reagan eliminated funding for school lunch programs around the same time Maggie got rid of your milk? Both felt it necessary to cut costs in the same area, do you think they chatted up about it? I wonder. My conservative father ADORED Margaret Thatcher as he ADORED President Reagan, and I guess some of it rubbed off on me. I always found her fascinating, as the most powerful woman in the world. Anyway, now we feed the kids in the LAUSD breakfast, lunch and dinner. No kidding. The pendulum always seems to be swinging too far in either direction! I'm sorry you didn't get to be milk monitor, though! Whatever else, the fact there has been no consistently, solid wave of women in the UK increasing their numbers on the Boards of all institutions since she left office in 1990 (over 20 years ago!) is pretty telling. I thought we would be the generation to do more without lobbying, without further discussion. I posted about Maggie too - I think it was important that we grew up with a woman as PM, even if you didn't agree with her (and she wasn't a feminist). I agree with Caroline though - she didn't exact help level the playing field in any noticeable way. Milk - if you had a mum who was a teacher, like I did, they knew that if you had a "health issue" you could still get free milk. So me and five other kids (all teachers' children) were declared to have "heavy winter colds", which we did - but then who didn't? And we got the milk till we left primary school I think. Mind you, in the winter you had to break the ice off the top and when it was warmer, well, god knows what kind of bacteria it was harvesting. Ooh yes I remember so clearly the importance of being milk monitor - it was very rarely me. This is the most powerful share ever.Thanks for these shares. Popping in to say that I miss you, Ali Blah Blah! Hope you and LK and the kidlets are fine and enjoying the summer! Yes, Margasret Thatcher was a great role model for girls, if nothing else. I still miss you and I check in weekly for anything new! Hope all is well. What are the girls going to be for Halloween? I check in here regularly too, to see how you are. I do hope all is well with you and your gorgeous family. Me again! A little girl in the new Mini Boden catalogue reminded me of your Lucy, and I was thinking of you. Happy New Year and hope all is well. Have you given up blogging? Long time sporadic reader checking in. "Irreverence is the champion of liberty and its only sure defense"